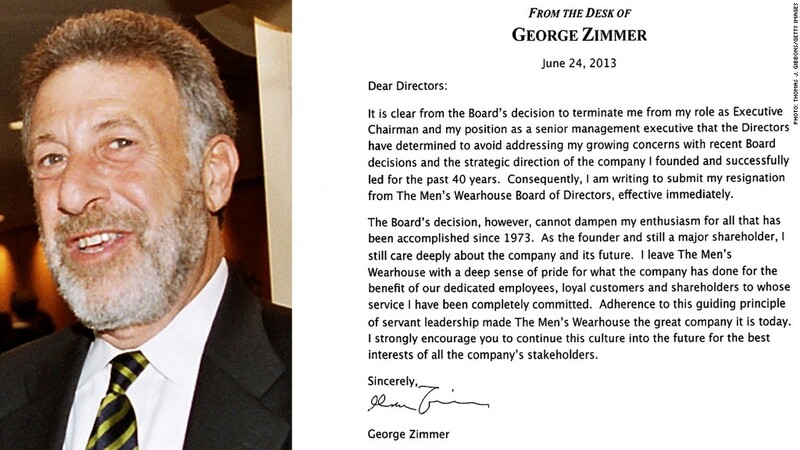 George "I guarantee it" Zimmer quit the Men's Wearhouse board of directors, after getting fired last week as executive chairman. George Zimmer, the founder and face of Men's Wearhouse, quit its board of directors on Monday, after getting fired last week from his job as executive chairman. Zimmer created the first Men's Wearhouse (MW) in 1973 and has become famous since 1997 for his "I guarantee it" ads. A resignation letter he submitted Monday said the board had ignored his "growing concerns" about the company but was otherwise scant on details. "It is clear ... that the directors have determined to avoid addressing my growing concerns with recent board decisions and the strategic direction of the company I founded and successfully led for the past 40 years," Zimmer wrote. The company has declined to explain why Zimmer was ousted as executive chairman. Zimmer declined an interview request from CNNMoney. Hundreds of shoppers expressed outrage over the firing last week on Facebook (FB).